“From the cutthroat world of competitive gardening…” Well with a line like that you have my attention. 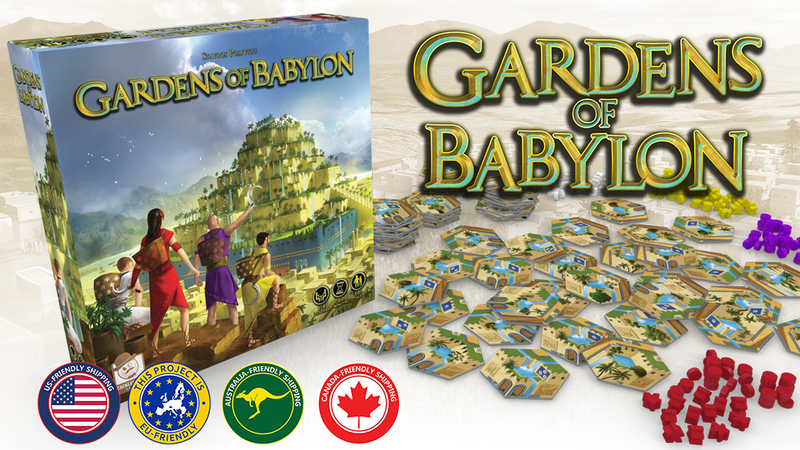 Gardens of Babylon is a tile-laying game with a simple and devastating mechanic. You’ll be laying tiles and then moving your gardener as far as you can along the connected paths. If you land on an unclaimed space you can plant your flowers. The exciting aspect here is the cascade effect. 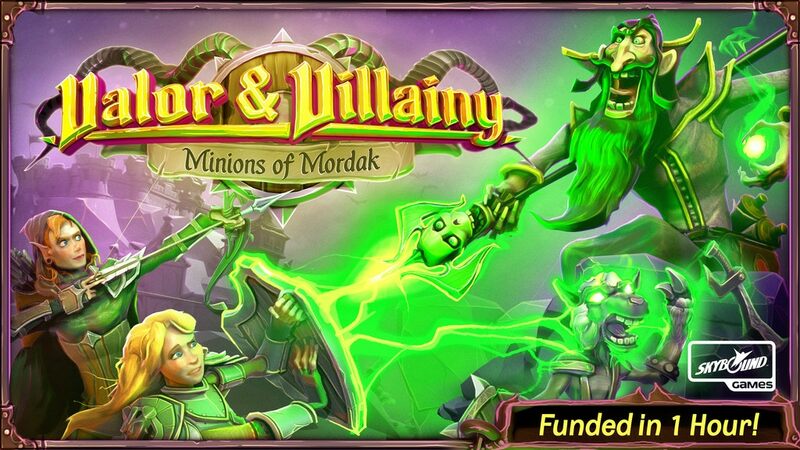 Valor & Villany: Minions of Mordak is a semi-coopertive, 1 vs Many game. Story goes that the king was recently catapulted (assumedly against his will). With the king in more a liquid state than a solid, his evil adviser, Mordak, is ready to take the throne after running a few errands. The heroes must stop Mordak’s evil plan before he returns in 8 days. To find Mordak and start the epic end battle, players must locate three ancient shrines. This will start the final fight and depending on how well the adventurers prepared either they or Mordak will be victorious. I love that the game doesn’t take itself too seriously. Check out this light-hearted, fantasy fighting game on Kickstarter here. 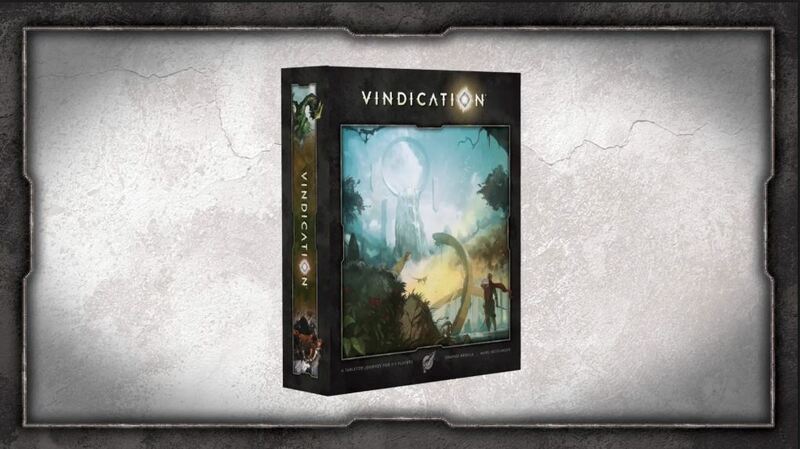 Vindication is an area influence game where the players seek to restore their lost glory by acquiring new skills, finding companions, and hunting down dangerous bounties. With all this talk of adventuring and capturing bounties, I was expecting something more Ameritrash; with hordes of minis and plenty of dice rolling and fighting. What I was surprised by with Vindication was that it is actually more of a euro-style game. 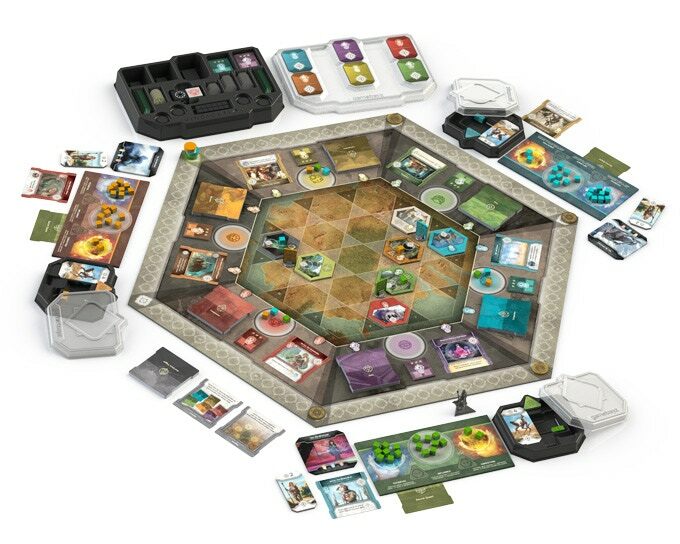 You have 3 actions each turn to either move around the board, interact with map tiles, or use your companions. many actions will require you to utilize your attributes (resources) in what publisher Orange Nebula calls a “Heroic Attribute Alchemy System” By earning and combining attributes you can perform powerful actions and earn huge rewards. The management of your attribute resources is really interesting and I’m very curious to see how it all plays.You can learn more about this interesting mechanic and the game as a whole on the Vindication Kickstarter campaign here. NewSpeak is an area-control/deduction game set in a dystopian world where dissidents try to plan a meeting the controlling moderators try to discover the location of the meeting by cracking the dissident’s codes. At the start of the game everyone will decide which of the 4 code sets will be used. Then the dissident team will use one of the cards in that set as their code, but keep it secret from the moderator team. During the game the dissidents will start a conversation using key words from their chosen code set to communicate which of the 9 locations they are meeting at. While the dissidents chat, the moderators can also talk and take notes, trying to figure out which code card the dissidents are using and then discover the location they are discussing. I suspect Newspeak will be a clever, nerve-wracking experience; perfect for people who like social games with a darker twist. 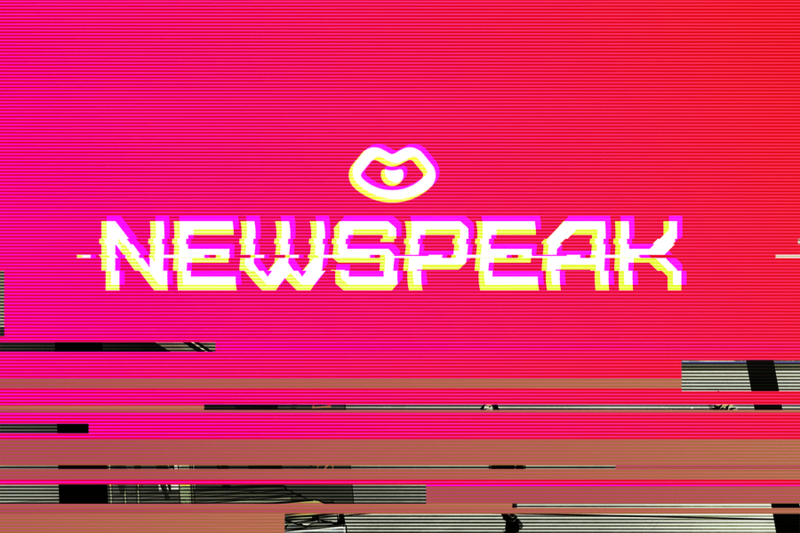 You can learn more about NewSpeak on its Kickstarter campaign here. Sometimes games just get too real. Too Many Poops is the story of any cat owners life. 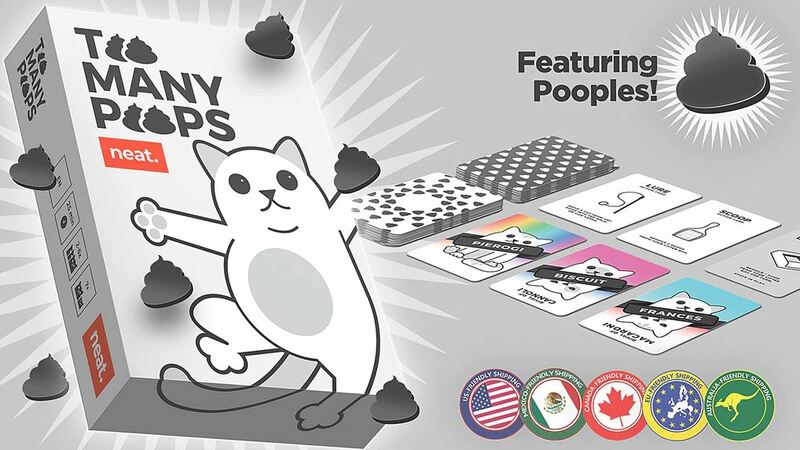 It’s a hand management/set collection game where you want to be the first to score 10 points worth of cats without being overwhelmed by poop. 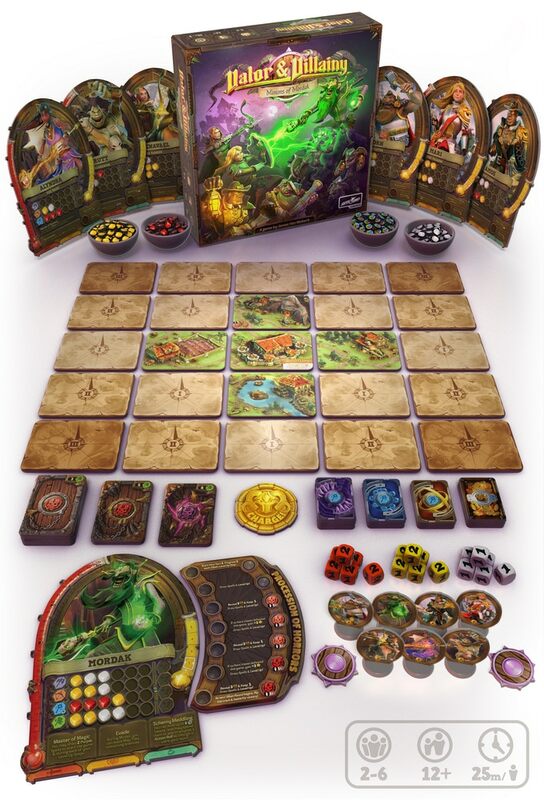 Each turn you’ll draw item or cat cards from the face-up cards or blind-draw from the deck. Cats give you points and item cards will help you manipulate cats and dispose of poop. 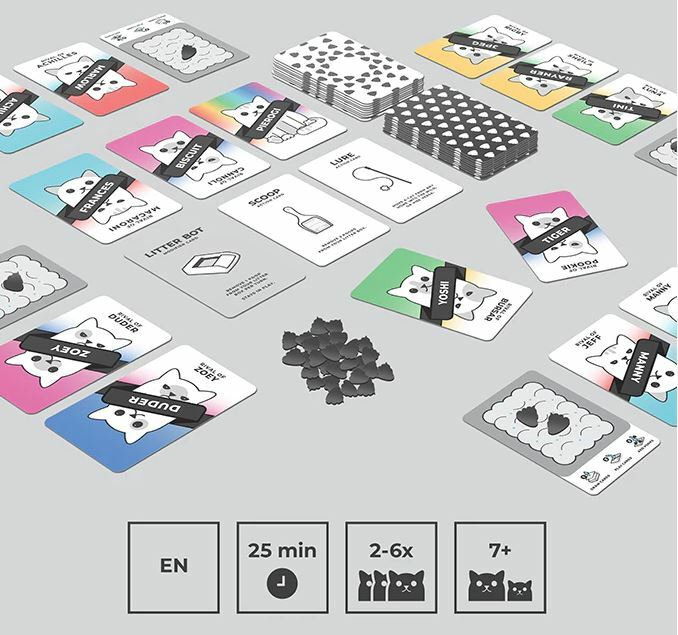 Cat cards form sets and score you points, but if you place cats who are rivals of each other in the same home, the cards flip and give you no points. The real kicker is: At the end of the turn, each cat card gains 1 poop token (even the 0 point cats). If you ever have 10 poops, you’re out. Now I don’t like games with player elimination usually, but the hilarious theme, ridiculous artwork, and the promise of pooples (poop meeples) has lured me in. Live out your cat owning dreams/nightmares by checking out Too Many Poops on Kickstarter here.